While traditional card games will always remain our favourite card game titles, from time to time we enjoy playing a variant or two. One variant which we can’t get enough of is Red Dog. Based on the game of poker – though the only real similarity is the ranking of cards – the title is available at many of recommended online casinos for our international readers to play (Australians are no longer able to play card games online for real bets after September 2017 due to new laws). We detail how to play and the best places to learn and practice the unique card game. 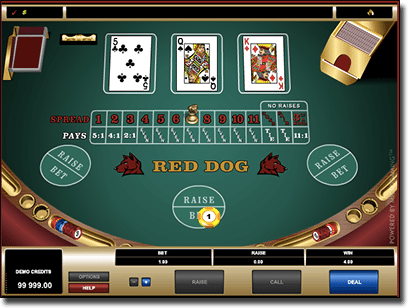 Red Dog is a poker variant, which is said to have originated in the US in the 19th century. It was known as In-Between then, as the player wins if their third card drawn ranks in-between the two cards drawn first. Its popularity has declined thanks to the increase in popularity of poker, so it isn’t likely you will see it regularly at land-based venues. However, there are a few top software providers who offer the title online – but instead of being called In-Between, you will find it under the name Red Dog. Red Dog generally involves a standard deck of 52 cards, however you can get up to eight decks so be sure to look at the title’s rules. Players receive three cards at a time, with each card in a deck ranked similarly to how cards are ranked in poker – with Aces the highest value and twos the lowest value. Additionally, the suit is not important here. A spread is the number of cards available between the first two cards. A marker will land on the spread number on the online variants to help with your strategy. The payouts remain the same irrespective of the number of decks in play. Unlike 21, there isn’t much strategy involved in a game of Red Dog. The basic strategy involved is to raise when you have a spread of seven or more (though this strategy is based on when six or more decks are in play, but is also advised in a single deck Red Dog variant). This strategy relies on the probability of winning as a spread of seven or more has a probability greater than 50% of the third card falling between the first two cards. You can decide whether you want to raise for a spread of six as it is close to a 50% chance of winning, but you should avoid raising with a spread of five or less, as the probability of winning isn’t in your favour. The house edge is incredibly important for all casino games, as the lower the advantage the more chance you have of winning. The more decks in play, the lower the house edge so we recommend trying to find a variant with a number of decks involved – eight if possible. However, online it may not be easy to find this. One deck still has a reasonable house edge though, and can be better than some other poker variants, such as Caribbean Stud. 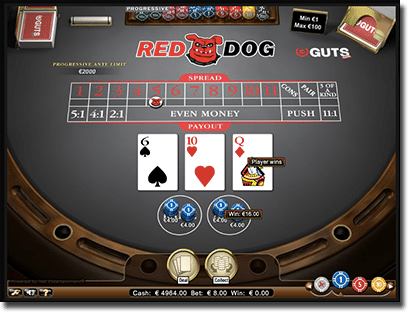 You will find Red Dog titles at some of our recommended online casinos, with two of the top software developers offering a version. Net Entertainment: Played with a standard deck of 52 cards, with the title available at www.GDayCasino.com. There is progressive betting available on this version of Red Dog, too. Microgaming: Played with a standard deck of 52 cards, with the title available at www.RoyalVegasCasino.com.